Some of the manufacturer specifications for the Morpheus eyepieces are provided in the table below (figure 2). With the AFOV and eye relief (ER) specifications, I have also included direct measures performed indoors on a test bench to verify if they are "close" to the published specifications. Keep in mind that, while these measurements were done carefully, there is always room for error. Only when they deviate significantly from the published specifications would there be cause for further investigation (into the measuring process or with the vendor). As an example, in my measurements I found all specifications within a reasonable margin of error compared to the published specifications except for the 17.5mm Morpheus which, at the time of my testing, had a published eye relief of 19mm. My measuement of 24mm was triple checked and remained the same, so I contacted a vendor regarding the discrepancy. They contacted the manufacturer and discovered that the published material was incorrect and the eye relief specification has since been corrected. NOTE - My previous review of the other focal lengths of the Morpheus line can be found here: https://astronomyconnect.com/forums/articles/the-baader-planetarium-morpheus.3/. Fig 3: Items included in the box with the Baader Morpheus eyepieces. 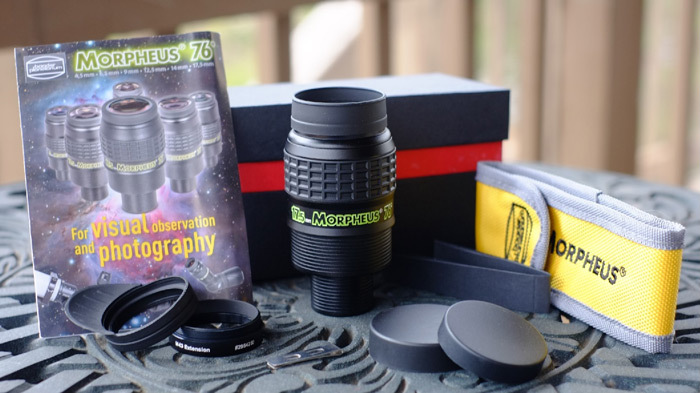 The packaging for this eyepiece is both attractive and informative, and it includes a manual showing various adapter options for the eyepiece as well as a list of all its major features. I really liked the attention to detail with the contents: Baader supplies two different eye guard options and multiple top caps to fit the various configurations, and an extension ring to extend the eye guard even higher. The inclusion of a carry pouch that can be attached to a belt is novel and useful for those who may only use a few eyepieces during an observing session. The Morpheus line uses a glow-in-the-dark graphic to allow reading the focal length in the dark, and it includes a little customizable indicator clip with tactile protrusions for the carry pouch that can be used to tell one focal length from another. I thought this new addition was quite innovative since I am forever forgetting which eyepiece is which when observing at dark locations. All-in-all the packaging includes many nice additions to the eyepiece, conveying more of a "system" approach to its use and function. With this newest addition to the Morpheus line, Baader touts an improved eye guard. The rubber feels just a little thicker and more importantly, it now screws onto the eyepiece so it stays in place when folding and unfolding. There is also an extension ring to extend the eye guard further if desired, making the overall approach much more flexible and completely stable. While many, if not most observers prefer the barrels on eyepieces to be smooth, the industry has for some time provided the barrels with a form of safety feature to help prevent an accidental slipping of the eyepiece out of the focuser should the observer not properly attach the eyepiece to the telescope. One type of safety feature is called the undercut, a feature which has earned the disdain of much of the observing community. The undercut is generally a cut out indentation in the barrel where the set screw or compression ring is meant to engage the barrel if they properly align. There have been several attempts by manufacturers to improve the basic undercut feature, but most that I have tried either fail to resolve the issue of the undercut hanging up when extracting the eyepiece, or they introduce other issues such as tilting the eyepiece away from a square seating when the compression ring is tightened. The unique safety kerfs design used by Baader appears to overcome the issues that the standard and modified undercut design introduced. Over the more than two years I have been using the Morpheus eyepieces, the design has not shown any propensity for getting hung when trying to extract them from the focuser. In the field they perform very much like a smooth barrel, inserting and extracting without issue. All Morpheus eyepieces also use a housing design that incorporates a dual 2" and 1.25" barrel. This allows the eyepiece to be used in either size focuser without the need for adapters, which means one less item to fiddle with in the dark at the telescope. As with all dual-barrel designs however, the observer should always first test that when using the 2" barrel with a diagonal that the 1.25" barrel does not extend so far into the diagonal as to impact the prism or mirror surface. Fig 4: Eye lens view with eye guard removed for easy cleaning (left) and field lens view with light baffle (right). Finally, the overall build quality of the eyepiece itself is very good. It feels good and solid in the hand with excellent fit, finish, and heft. The eyepiece is sealed to help protect the internal elements from moisture and dust. Because of the sealed construction, it is not readily apparent how they would be disassembled (which is not recommended). Normal hand force will not unscrew any part of the housing or barrel. The sealed nature is also evident when looking at the eye and field lenses as there are no retaining rings to be seen. Field testing took place over several weeks in a Yellow Zone in rural Virginia where the Sky Quality Meter readings range between 20.5 to 21.2 mag/arcsec2 on Moonless nights. Outdoor temperatures during field testing ranged from +13° to +60° F.
All outcomes are recorded at the time of occurrence at the telescope using a voice recorder. Each performance test is generally replicated three or more times, and in multiple telescopes with multiple accessories to ensure they are consistent and accurate. If there are discrepancies or conflicting test results, then those tests are redone until the root cause of the initial discrepancy is discovered. Any test related to assessment of perceived contrast, brightness, background FOV uniformity are only conducted on Moonless nights of darkest skies. Testing was accomplished in the Takahashi TSA-102 f/8 Super Apochromatic refractor, Lunt/APM 152 f/8 ED-Apo, Orion XT10 254mm f/4.7 Dobsonian, and a Pentax 65 ED II f/6 spotting scope. Diagonals used were Baader Zeiss 2" Prism, Baader Zeiss 1.25" Prism, Baader BBHS 2" Silver Mirror diagonal. A Tele Vue 2.5x Powermate was employed when more magnification was needed, and the following eyepieces of similar focal length were used to assess comparisons in performance: 20mm Pentax XW, 18mm Takahashi LE, 17mm Sterling Plossl. 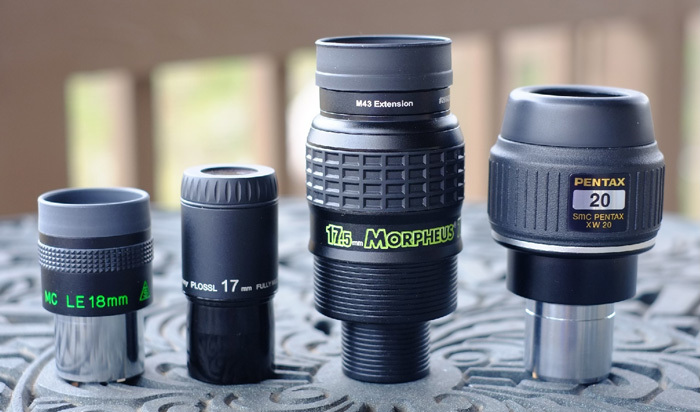 Fig 5: Size comparison of the Baader 17.5mm Morpheus compared to other eyepieces used in testing. 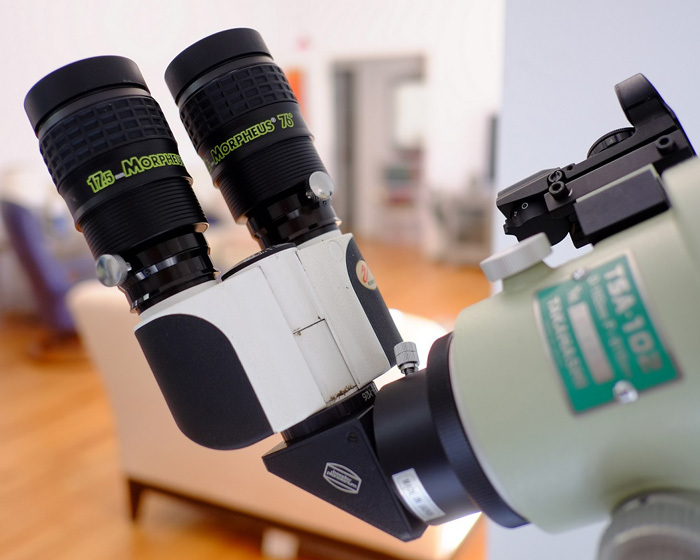 Fig 6: Pair of 17.5mm Morpheus with Baader Zeiss 1.25" prism diagonal in the Takahashi TSA-102 on a Vixen Porta-II Mount. Typically, I run eyepieces through my battery of tests, then I just spend time observing with them instead of evaluating. This time around, I decided to reverse the process and instead go out and just observe for a few sessions before I began the formalized testing. I like binoviewing, but mostly only for planetary and lunar observing. I rarely binoview deep sky objects (DSO) because I do not like the extra hassle of setting up the binoviewer, and because I feel it is a handicap since many DSO are dim and the binoviewer splits the light beam so only half the light from the object is coming into each eye. Since the TSA is fairly binoviewer friendly, and I was using the very short light path of the Zeiss 1.25" prism diagonal, I had no need for the optical corrector accessory (OCA) on the binoviewer. Without the 1.6x magnification of the OCA, I could enjoy the nice low magnification (47x) and full 1.6° true field of view (TFOV) the 17.5mm Morpheus eyepieces provided in my TSA-102 refractor. I started the binoviewing excursion with the great Orion Nebula, M42, and my initial reaction was to be completely blown away by the view! More than the entire Sword of Orion, with lots of room to spare around the Sword, filled the field of view (FOV). Visual contrast came across as superb and the star points were all perfect across the FOV. But the biggest impression was the contrast. The nebula itself looked "neon sign" bright, and as bright as it was in all the dark spaces around and between the nebula, the field remained richly black which added to that neon-like impression. The Fish Mouth was nicely defined as well as the dark lane through M43 that, to me, makes it look like a Pacman eating its way around. The mottled structure of M42 was quite prominent showing portions of the nebula as a lattice-like structure of dark spaces which coursed through the bright filaments of the nebula. Then, of course, the four burning hot blue stars of the Trapezium glowed iridescently amidst it all. Below, nearer the field stop, little Iota Orionis with its companion star remained nice and sharp and nicely spilt. Then I shifted my gaze upward in the FOV to make a brief observation of the nebulosity around the Running Man Nebula and 42 Orionis. Finally, I moved my gaze to the top of the FOV above the Sword to the open cluster NGC 1981. I've always liked this little grouping of stars, but I never tend to linger there observing them. However, with such a comfortable binoview and a nice large patch of TFOV I ended up staying on NGC 1981 for quite some time -- so much so that I ended up noticing some things about it that I never did before. One of the new features I saw of this cluster was how, just to one side of the main grouping of stars, there is a small gap then another clutch of a few stars. This extra grouping of stars was quite obvious in this view, but I have never noted the separate little grouping of stars before. It is always fun discovering something new, so I loitered on this target and really enjoyed the cute little cluster for quite some time. As I lingered, mesmerized by the view, I began to realize just how long I was observing the various targets yet I was not encountering any eye fatigue. Unlike my typical monoviewing with one eye squinted closed and the other usually pressed up against an eye guard, this binoview was a completely natural feeling. It was just like normal viewing since the eye relief of the 17.5mm Morpheus was long enough that, with the eye guards folded, no part of my face or nose had to come close enough to touch any part of the eyepiece. I was also finding that, unlike with other wide field eyepieces, I did not need to move my head positioning over the eyepieces as I scanned the FOV from center to field stop. So in addition to the nice stand-off distance, I could also just shift my gaze to anyplace in the FOV without any blackouts or need to alter my head position. I just had to roll my eyeballs. Overall, this was the first time that I have really enjoyed extensive binoviewing of a DSO! Next, I drove the TSA-102 with binoviewer up to Orion's Belt, enjoying the ring of stars that circle Alnilam, then moved right to Mintaka to observe that wide double, then all the way left to Alnitak where I was treated to the unexpected sight of the Flame Nebula for the first time! I've never had a lot of success trying to see this with my smaller aperture scopes but there it was, dim and not quite averted vision only, but still an easy catch with the binoviewed 17.5mm Morpheus. Fig 8: The Sigma Orionis multiple star system (STF 762). Graphic by the author. From there I went up briefly to M78 (not a special object for me), then back down to visit Sigma Orionis. Oh my! Sigma Orionis is just such a pretty multiple system. I can't adequately express just how enchanting this multiple star system appears for me, so I had to stay on station for quite a while observing and imagining what it must be like to be in the midst of this beautiful star system. With the TV 2x Barlow three of the four stars of Sigma Orionis were easy to see, and the dim fourth member was very difficult. Moving from the TV 2x to the TV 2.5x Powermate made the observation much nicer through the 17.5mm Morpheus, and even the dim fourth member of Sigma Orionis was quite an easy catch in the TSA-102. 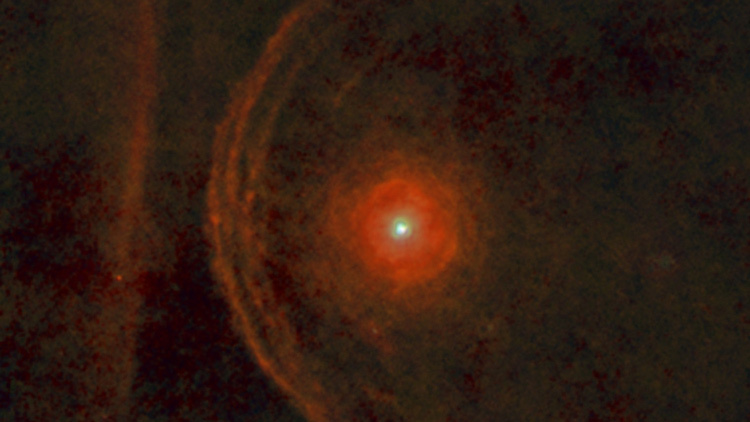 Fig 9: Composite color image of Betelgeuse showing its leading bow shock interaction with the interstellar medium. Credit: ESA/Herschel/PACS/L. Decin et al. When I was finally able to tear myself away from Sigma Orionis, I moved upward to the gargantuan beast of a star, the red supergiant Betelgeuse. If you have never studied the literature on this star, then I advise you do so because some aspects of it are simply mind blowing! First off, it is absolutely huge, with portions of its atmosphere extending out to almost the orbit of Jupiter if it was placed in our solar system. Then its shape is not even round and its surface is not even uniform with multiple hot spots. It is even moving so fast through space that it is travelling faster than the solar matter it is spewing from its solar winds so that its own star material forms a bow shock wave in front of it! All I can say is that we are lucky that this beast is not too close to our nice and quiet little neighborhood of stars. But while observing Betelgeuse, in the same field of view you will also see the nice little double HD 39758 and HD 39759 just to the south (WDS 05549+0702). This little pair of magnitude 8.7 and 8.9 spectral class A and K stars are dim and offer quite a juxtaposition next to the giant Betelgeuse. So, while not an overly aesthetic double, given the juxtaposition to Betelgeuse they are a fun observation. 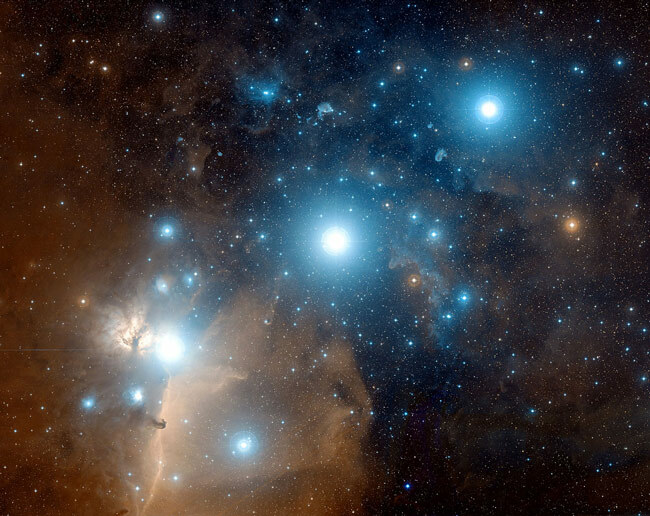 From there I went upward more to NGC 2169 (the "37" cluster) then over to the Hyades to look at my favorite grouping of six stars of which Theta-1 Tauri is a part. These six stars are arranged in three pairs of two, with each pairing forming the apex of an equilateral triangle. I love the cool asterism formed by these six stars. It reminds me of a portal or star gate in space just waiting for incoming or outgoing spacecraft. 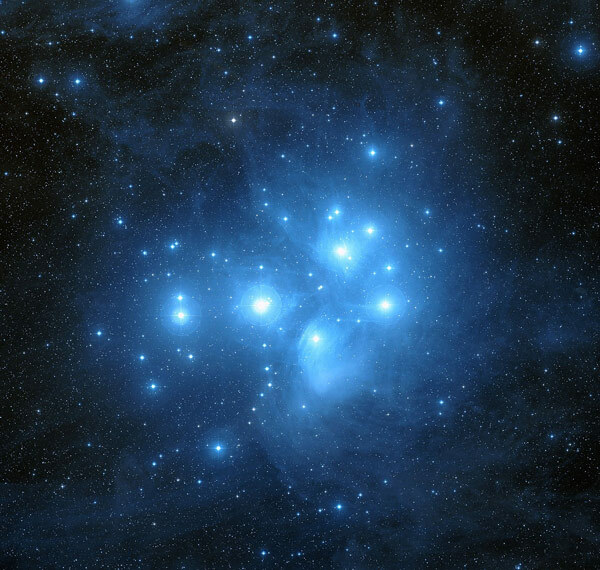 Fig 10: Messier 45, the Pleiades Cluster. Credit: Davide De Martin & the ESA/ESO/NASA Photoshop FITS Liberator. Finally, to end this very first observing-only outing with the 17.5mm Morpheus in a binoviewer configuration, I slewed over to M45, the Pleiades cluster. These hot and young stars filled the FOV like gleaming searchlights, shining in all their wondrous glory. This cluster is many times an acid test for the off-axis of a wide field but for the Morpheus in the TSA-102 it was a walk in the park. All these big and bright stars kept their pinpoint nature across the FOV right up to the field stop. The view of the tight stars across the FOV with this cluster was also replicated in the Pentax f/6 spotting scope, the 6" f/8 Apo, and the Orion XT10 f/4.7 Dob with Paracorr. In successive outings of both binoviewing and monoviewing, I revisited all the above mentioned objects, and observed a number of other quite beautiful stars, multiple stars, a globular cluster, and open clusters in the adjacent constellations to the north, south, east, and west of Orion. Of these I think that Caroline's Cluster (NGC 2360) and M46 deserve special mention. Both of these were enchantingly beautiful open clusters, especially through the 6" Apo. The memory of the view continues to stay with me, they impressed me so. All these objects and more I observed not only in the TSA-102, but also in the Lunt/APM 152 f/8 ED-Apo, and through the Orion XT10 254mm f/4.7 Dobsonian. As I said, many of these objects remain as pictures in my memory as they were stunningly portrayed though the Morpheus with a level of contrast and transparency that reminded me of my cherished Pentax 30 XW eyepiece, which is my all-time favorite eyepiece. The views were so enthralling for me that after each session I could not let it end. Once I stowed all the equipment back in the house, instead of going off to bed I instead immediately went to my Interstellarum Deep Sky Atlas to retrace the nights journeys, cross referencing my Burnham's Celestial Handbook, the Night Sky Observer's Guide, and the Atlas of the Messier Objects until sleep got the better of me. The views got me so charged up each night that I just could not let the adventure end, and it has been too long since I've had observing sessions like that. 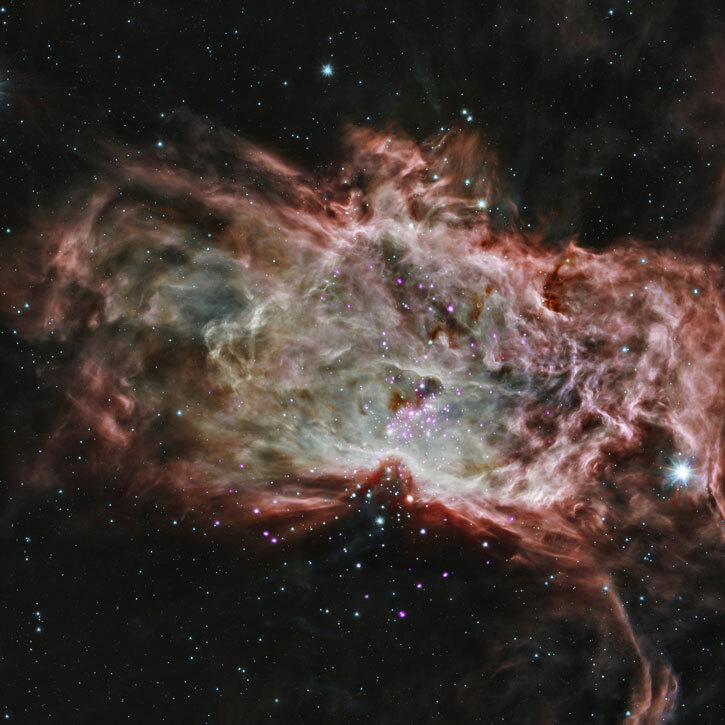 Fig 11: Orion's Belt / Collinder 70. 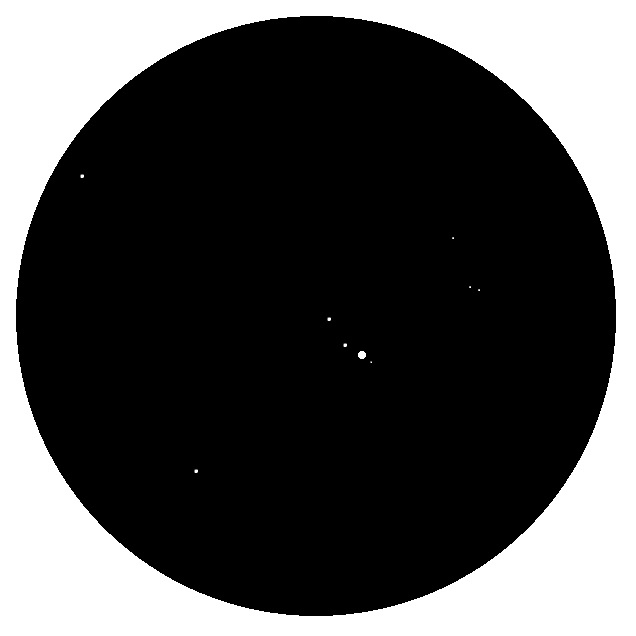 Observing the ring of fainter stars around the central Belt star Alnilam is a favorite. Credit: Davide De Martin & the ESA/ESO/NASA Photoshop FITS Liberator. Overall, through the course of the field assessment, several impressions stood out. First, the 17.5mm Morpheus is exceedingly comfortable to use. The exit pupil is very stable and not once did I encounter any blackout or kidney beaning. Eye relief was also both long and comfortable, and flexibly adaptable. There are essentially six different configurations you can use with the eye guard: 1) no eye guard, 2) standard eye guard unfolded, 3) standard eye guard with M43 extension ring, 4) winged eye guard, 5) winged eye guard with M43 extension ring, 6) either standard or winged eye guard folded down. My preference when binoviewing was with the standard eye guards unfolded. In this configuration I found external light was effectively blocked but I could still use the eyepieces without much of any contact between my face and the equipment, so observing was with two eyes and felt very natural. When monoviewing I preferred either the standard eye guard with the M43 extension ring or without any eye guard. I also discovered that without any eye guard, the long eye relief and slim housing made the Morpheus 17.5mm behave a lot like the Edmund 28mm RKE where the view somewhat floats in space. It was a lot of fun to observe this way because unlike the 28 RKE, the exit pupil of the Morpheus is very stable, comfortable, and does not black out. Also, unlike the RKE, the housing of the Morpheus does not vanish so it is not as dramatic of an effect as with the RKE, but it is close enough and nicely controlled and comfortable. The final general impression was the contrast and transparency of the view. It was markedly clean, crisp, and transparent, so the eyepiece seemed to get out of the way when viewing more than most I have experienced – open star clusters and star fields really "popped" as a result and provided me with quite a number of dramatic views. I guess all good things must come to an end, so the time eventually came to stop the field assessments where I just observe and log impressions, and move onto the more discrete testing looking for specific performance items. While I did do some comparisons between the 17.5mm Morpheus and my other eyepieces of similar focal length, most of these were not really in the same league, and the one that was, the 20 XW, had a focal length that was too different for effective comparison. So these comparisons were just casual in nature as neither the 17mm Sterling Plossl nor the 18mm Takahashi LE could muster up anywhere near the perceived contrast, brightness, and edge correction that the Morpheus was delivering. The major take away from comparison with the 20 XW was that the 20 XW was nowhere near as well behaved off-axis as the Morpheus. It showed significantly more field curvature than the Morpheus, and given its longer focal length and therefore larger exit pupil, showed a less contrasty view since my Yellow Zone observing site does have some level of background light pollution. Another interesting impression I had when comparing the views between the 17.5mm Morpheus and the 20mm XW was the effect of the larger 76° AFOV vs. 70° AFOV. You would not think the difference would be all that much, but each time I moved from the Morpheus to the XW I got the impression of the latter's FOV being more constrained, even though the TFOVs between the two eyepieces was fairly close. Field curvature is more a factor of focal length rather than focal ratio, but it does not always follow that directly if the optics are more complex and include flattening. This was evident in my tests as while my shortest focal length scope, the Pentax 65ED-II (f/6) with its 390mm focal length showed no FC with the 17.5mm Morpheus, the TSA-102 (f/8) with its 816mm focal length did show a small amount of FC. At first look, given the much shorter focal length of the Pentax spotter, you would expect it to show more FC than the longer TSA-102. The TSA-102 is a conventional triplet objective and nothing more, however the Pentax spotter has additional elements in it which are no doubt are contributing to its flat field performance (5 elements in 3 groups). The FC exhibited in the TSA-102 could be cleaned up with just a turn of the fine focus knob. This small amount of refocus is consistent with what I have experienced with many other eyepieces in the telescope so I am fairly confident it is probably from the main objective. Moving to the 1200mm focal length 6" f/8 Apo and Orion XT10 (f/4.7) without Paracorr, neither of these instruments showed any FC between the center of the FOV and the field stop. With the addition of the Paracorr to the XT10 however, at the setting where I was able to achieve a complete elimination of the coma at the field stop, this position left a very minor amount of FC at the field stop. However, the FC was so minimal that it did not affect double star splits. So Rigel, for example, was still tight and nicely split even at the field stop. 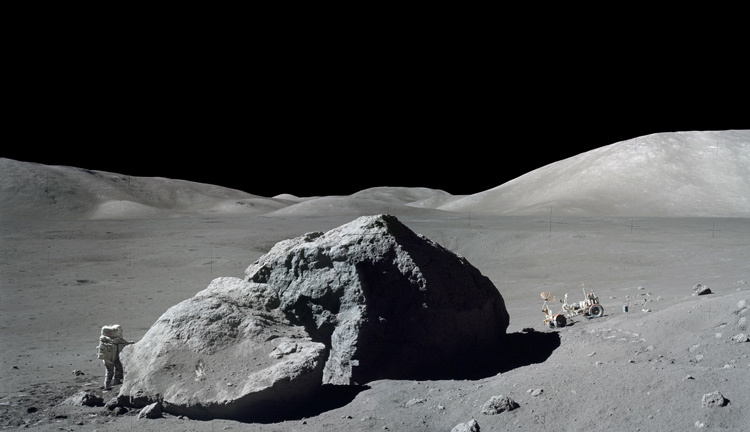 Fig 12: On Dec. 13, 1972, scientist-astronaut Harrison H. Schmitt and the lunar rover of Apollo 17 are shown amidst the starkly contrasted lunar surface at the Taurus-Littrow landing site. Credit: NASA JSC. This is one of the easiest aberrations to detect, and it is present in all wide field eyepieces I have used. In the Morpheus, I characterize it as minimal. I could just begin to see it on a bright star like Rigel at about 75% from center. It showed primarily as a small amount of blue fringe on the side of the star facing towards the center of the FOV through my TSA-102 with Zeiss 1.25" prism diagonal and in the XT10 Dobsonian. When the star was at the field stop, the small color fringe was about the same but still not objectionable by any means as Rigel stayed a nice split all the way to the field stop. When observing the Moon, the limb of the Moon when it was nearer the field stop would show either a thin blue line off the limb or a thin lime green line off the limb, depending which side of center it was. Again, I felt it was minimal and neither very bright nor very wide, and at no time did the color extend into the lunar surface. The lateral color did not seem to get any more pronounced as the focal ratio of the telescopes became faster, so I estimate it was approximately the same in my f/8, f/6, and f/4.7 telescopes. The 17.5mm Morpheus showed no astigmatism for me in any telescope. So racking a bright star in and out of focus only showed a nice round set of diffraction rings in my f/8 Apos, my Pentax f/6 65EDII spotting scope, and my Orion XT10 254mm f/4.7 Dob with or without Paracorr. But this was not the case when I began the testing. When I started the astigmatism tests things went a little differently and what happened serves as a reminder and lesson. I started my testing with the TSA-102 and did my normal battery of tests, including testing for astigmatism. At the initial end of testing in the TSA-102, I noted there was a very slight amount of astigmatism in the far outer FOV. I could only detect it when racking the star in and out of focus, and the diffraction rings would just be very slightly out of round, then altering direction depending if the star was out of focus from out travel or in travel of the focuser. It was not consequential to in-focus star points as they stayed nice and tight, but nonetheless it was there. When I went on to testing in the XT10 with Paracorr, I was of course expecting to see the astigmatism again, but it was not there. However, I did not think that was too odd because the Paracorr really cleans up some eyepieces. But just to be sure I decided to then try the Morpheus in the XT10 without the Paracorr. I usually don't test without Paracorr because no eyepiece eliminates the coma which typically overwhelms all other off-axis aberrations. But my purpose here was to do the test and separate the coma from the astigmatism in the observation, and not to see how poorly the off-axis performance of a faster Newtonian always makes the view appear. When I completed the astigmatism test without the Paracorr, I was very surprised as there was no off-axis astigmatism to be seen. This was completely unexpected as I saw a minor amount in the f/8 Apo and now none in a very much faster f/4.7 Dobsonian! I saw lots of coma, but zero astigmatism. Now that was of course odd and if anything, I would have expected more astigmatism given the Newtonian is so much faster than my Apos. I decided to let the puzzle be for a while and went on to testing with my 6" f/8 Apo. When I completed the astigmatism tests, I was once more surprised as I was getting perfect star points right to the field stop in the 152mm f/8 Apo, but I did not get this performance in the 102mm f.8 Apo. I then decided to flip the diagonals and took the diagonal that was on the TSA-102 and put it on the 6" Apo. After doing that, the 6" Apo was now also showing mild off-axis astigmatism! So it was never the eyepiece generating the astigmatism. It was the trusted prism diagonal I had on my TSA-102. Taking the diagonal apart, I discovered there was some contact pressure on the apex of the prism. I relieved this pressure by not screwing the housing back together as tightly as before, and when I put the diagonal back into service this resolved the astigmatism. The morale of this story is to never assume something you are seeing is from the eyepiece when testing the eyepiece in a single optical chain, even when using trusted components. Before you can reasonably conclude the issue is with the eyepiece, you really do need to be diligent and switch out all components in the optical chain, and repeat tests using your left and right eyes separately, and if warranted, even ask an observing buddy to repeat the tests as well. In my opinion, it is not possible to separate brightness from contrast in visual field tests. If a dim star is only visible with averted vision in one eyepiece, but direct vision in another eyepiece of the same focal length, that visual difference can be due to a multitude of factors operating in concert such as mean transfer function (actual instead of perceived contrast), transmission, coatings, baffling, and perhaps others. So rather than attributing observations to a discrete root-cause criteria, I think it is more effective to just describe the differences of how the targets appeared and draw no conclusion as to whether it was in fact a contrast difference, or a transmission difference, or some other factor. In comparing the 17mm Sterling Plossl to the 17.5mm Morpheus, overall I felt the view was just as bright in both. Faintest stars in clusters were just as visible in either eyepiece, and the extent of nebulae were also just as visible. Where the visual differences showed was in the character of the background FOV and in the detail and structure of the nebulae. In the Sterling the background FOV was brighter than in the Morpheus. As a result, the definition of the edges of nebula was starker and more defined in the Morpheus. Additionally, the internal mottled structure of M42 and the dust lanes of M43, the Running Man Nebula and the Flame Nebula were all more discernable in the Morpheus whereas it looked milkier in the Sterling. In the Takahashi LE it was just much dimmer overall. 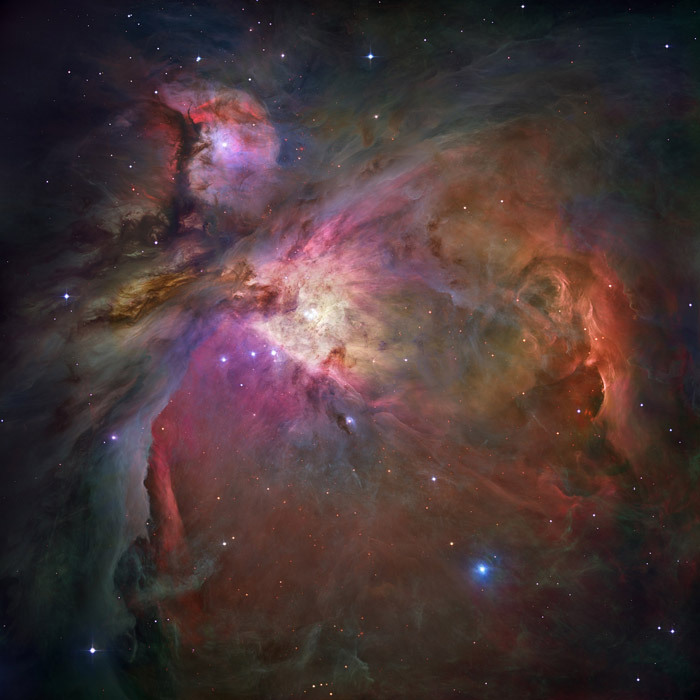 With the Flame Nebula, which was very faint in the 4" Apo scope, its outer boundaries were exceedingly difficult to discern in the Sterling, and more defined and obvious in the Morpheus. In the 6" Apo, the Flame Nebula with the Morpheus was actually an easy target and nicely defined both in external extent and internal dust lane. The Takahashi LE did not compare well at all, comparatively showing a much dimmer view of nebula, less extent to the nebula, and less definition and detail. On Lunar observing, the Morpheus showed features quite stunningly contrasted and also very ‘dimensional' in nature. Adding the 2.5x Powermate to the Morpheus upped the game and provided a wealth of closer-up details that were all distinctly etched. The perceived brightness and contrast from the views with the Morpheus were quite impressive overall. Perhaps the best way to characterize this was that no matter whether I was observing an open cluster, or a nebula, or the Moon, the bottom line impression was that the view was exceedingly clean, bright, and transparent. Compared to the 18mm Takahashi LE and the 17mm Sterling Plossl, the 17.5mm Morpheus showed the least amount of scatter. I used a variety of stars to assess this from very bright Sirius, to others such as Bellatrix, Rigel, Iota Orionis, and the stars in the Belt of Orion. Compared to the Sterling, the Morpheus showed significantly less extent to the scatter and the scatter was dimmer. The scatter was uniformly reduced compared to the Takahashi LE, but in the latter the scatter was markedly brighter nearer the star and slowly fell off. My overall impression was that scatter was as expected from premium-level eyepieces, and scatter was comparatively very low making observation of dim secondary stars of doubles all the easier. The region of the FOV near the field stop showed no brightening or dimming. The field stop itself showed as distinct, but not as a completely etched line because it showed a slight blue ring when observing the Moon. When observing all other targets, the field stop appeared tightly defined, but not razor-blade sharp. As a note, while my vision is normal, I do need to use reading glasses since I can no longer focus closely, so this could be contributing to how I see the field stop. Finding and maintaining the eye positioning to see the entire AFOV is easy and comfortable with the 17.5mm Morpheus. At no time during the testing did I encounter any difficulty, whether monoviewing or binoviewing. At no time did I experience any blackouts or kidney beans (spherical aberration of the exit pupil) with any combination of eye guard positionings, and even with no eye guard. Overall, the exit pupil behavior was very comfortable and the eyepiece provided a comfortable viewing experience in field use. Using very bright objects like Sirius and the Moon, I was unable to generate any unwanted light artifacts in the 17.5mm Morpheus while the objects were positioned throughout the FOV, or when they were positioned immediately outside of the FOV. I did not at any time experience eyeball glint off the top of the eye lens, nor did I experience any reflections from exterior lights around the observing location when the eye guards were in use. Overall, the light control features of the 17.5mm Morpheus proved to be effective. I encountered no ergonomic issues when using the 17.5mm Morpheus in the field at night. At no time did the eyepiece become hung on the compression ring in the focuser during insertion and extraction. Adjusting the eye guard by folding or unfolding it was easy, and even changing eye guards or adding/removing the M43 extension ring was effortless and intuitive in the dark, and the threading and unthreading went smoothly. And when a speck of dust or debris found its way to the eye lens during the evening's observing, I found that being able to quickly unscrew the eye guard made it very easy to field clean the lens with a quick swipe with a lens cloth or lens brush. With the eye guard in place, as with any eyepiece with a raised eye guard, it can be a struggle getting the debris off the eye lens then up and out over the eye guard unless you have compressed air handy – and note that one should never blow with their breath to remove any debris, as doing will cover the lens with micro beads of moisture and sometimes larger droplets that will dry and leave a stain until properly cleaned. At my test bench one day I decided to use my 20-50x inspection optic to examine an eye lens after conventional lens brush cleaning compared with using my breath to blow debris off the surface. At close inspection I was amazed at the number of small droplets that were left on the lens after blowing on it. Because of this, I now never blow dust off my eyepieces in the field. It is easier to just have a lens brush handy. While assessments of individual tests for specific aberrations or performance criteria tell a story, they do not inform you how all the various aberrations and performance criteria work together to bring you the final image. So this assessment is a general overview of characteristics of the FOV. Like most wide field eyepieces I have tested, the 17.5mm Morpheus does require accurate eye placement for best rendering of the entire AFOV. If your eye is not placed accurately over the exit pupil, then far off-axis star points can show some level of aberrations. Therefore, observing chairs and eye guards are always a wise recommendation for use with long eye relief eyepieces, especially for novice observers. Overall, in all my scopes, the general impression of the FOV was that it was accurate and tight. Star points stayed nicely tight, and double stars remained split and well rendered from center all the way to adjacent to the field stop. The Morpheus appears to be designed for neutral FC (field curvature) from the objective as it showed the minor FC that all eyepieces show in my TSA-102 with its 816mm focal length, and it showed no FC to my eye in my longer 1200mm focal length telescopes. I do have a shorter focal length optic, my Pentax 65ED-II spotting scope, but this spotter has additional elements in it that are most likely, I would guess, flattening the FOV so the Morpheus 17.5mm showed no FC in that spotting scope. The only off-axis aberration of note was some lateral color that is common to most all wide field eyepieces. Aside from its generally excellent off-axis performance in my f/4.7 through f/8 scopes, the major take away for me was the starkness of the FOV. 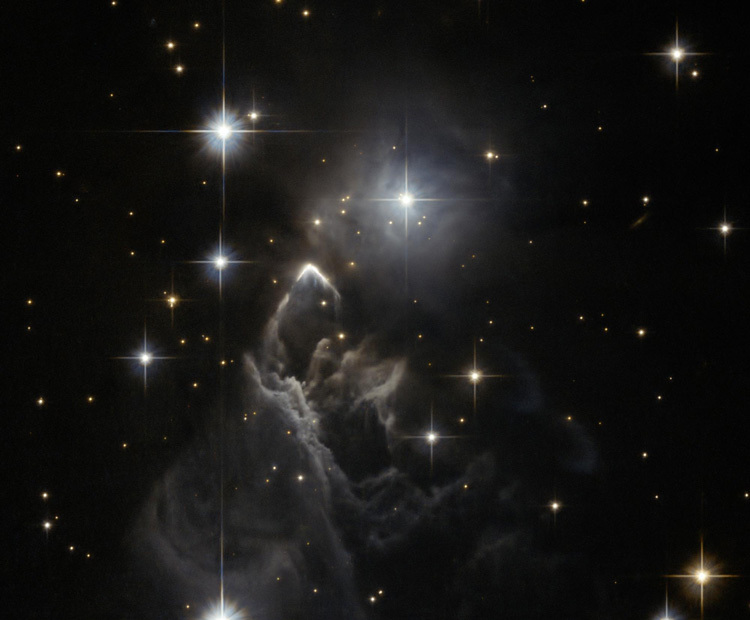 The background FOV showed richly black, even adjacent to bright portions of nebulae like M42. Its scatter control also contributed to very dark backgrounds around stars in rich open clusters. In many respects, I think the overall FOV of the 17.5mm Morpheus was clean and transparent and the focus snap was authoritative, which means the eyepiece got out of the way of the observations. To my eye, the latest addition to the Baader Morpheus eyepiece line up makes it seem like they saved the best for last. Operationally there was nothing I could fault with its performance in my scopes, which was a bit of a surprise for me as I tend to have some level of problems with longer focal length eyepieces. With this latest Morpheus addition, except for some expected minimal lateral color, it left me with nothing less than a string of highly memorable and often energizing observations where, once completed, I felt compelled to continue the adventure indoors investigating deeper into the objects I had just observed with my atlases and books. Its strengths include a bright, crisp, transparent, wide, and starkly contrasted FOV, generous eye relief, comfortable eye positioning, and hassle-free operation in the field. I so enjoyed this eyepiece that it now completes my core favorite eyepieces to make a very effective minimalist observing set – 30mm XW, 17.5mm Morpheus, 10mm XW, and 2.5x Tele Vue Powermate for premium wide field viewing, and 6mm ZAO-II and 5mm XO for critical planetary observing. Throughout the testing and observing, the 17.5mm Morpheus not only met but also fully exceeded all my visual observing needs for an eyepiece in this focal length class. The base optics of the 17.5mm are clearly exceptional, offering some of the most transparent and contrasted views I have seen, and should in my opinion provide a lasting wide field tool for observers for decades to come. Highly recommended! Bill's professional background is as an officer in the U.S. Air Force and as a computer scientist, holding a Bachelor's degree in Computer Science and a Master of Science in Education. He has worked for the U.S. Department of Defense, the U.S. Department of Commerce, the Federal Trade Commission, the Federal Reserve, the World Bank, and a variety of commercial corporations in the information technology, information technology security, and telecommunications industries. Bill has been observing as an amateur astronomer since the mid-1960's, grinding mirrors for homemade Newtonian telescopes during the 1970's and eventually owning, using, and testing several hundreds of eyepieces in a wide variety of telescopes from Achromatic and Apochromat refractors to Newtonian, Maksutov-Cassegrain, and Schmidt-Cassegrain designs. Today he enjoys observing and testing new equipment from his suburban home west of Washington, D.C., where his primary amateur astronomy pursuits are lunar, planetary, bright nebula, open cluster, and globular cluster observing. This article is © William Paolini 2018. All rights reserved. Images © William Paolini 2018. For permission to use images, contact the author at wapaolini@hotmail.com. BillP772 and Mak the Night like this.